Following its critically-acclaimed sellout season in 2015, the stunning stage adaptation of Alfred Hitchcock’s infamous spy thriller, North by Northwest returns to Arts Centre Melbourne in a strictly limited season from 29 January 2016. Declared ‘the Hitchcock picture to end all Hitchcock pictures’ by its screenwriter Ernest Lehman, the 1959 American spy thriller was an instant classic. Using 21st century stage technology, Hitchcock’s supreme suspense caper is brought to life, with every twist, every thrill, each pass of the crop-duster, and the thrilling climax on Mount Rushmore writ large on stage. When Roger O. Thornhill, a suave and successful advertising executive, is abducted by thugs who insist he is a man called George Kaplan, there’s obviously been a mix up. When they don’t believe him, that’s infuriating. When they try to kill him, that’s frightening. And when they pin a murder on him, that’s time to run! From New York to North Dakota, Thornhill is chased by spies, Feds and the glamorous, cool blonde. Adapted by Carolyn Burns and directed by Simon Phillips, North by Northwest sees Matt Day reprising his role as man on the run Roger O. Thornhill alongside Amber McMahon as Eve Kendall – his cool and collected love interest. They are joined on stage by a stellar cast featuring Nicholas Bell (The Speechmaker), Ian Bliss (Hamlet), Lyall Brooks (The Pride, Savages), Sheridan Harbridge (The Beast), Matt Hetherington (Next to Normal), Tony Llewellyn-Jones (Realism), Gina Riley (The Beautiful Lie, Open Slather), Lucas Stibbard (Boy Girl Wall) and Lachlan Woods (Hamlet). Across Simon Phillips’ 30-year career, his directing credits range from new works, Shakespearean classics, musicals and opera. His musical credits include Priscilla, Queen of the Desert, the Australasian version of Love Never Dies, The Drowsy Chaperone, and High Society. During his twelve years as MTC Artistic Director, Simon directed 60 productions including The Importance of Being Earnest, Hamlet, Richard III, August: Osage County, Cyrano de Bergerac, The Visit, The Blue Room, Life x 3 and Bombshells. Last year he directed Pennsylvania Avenue for MTC, reuniting with Joanna Murray-Smith and Bernadette Robinson after the runaway success of Songs for Nobodies. Carolyn Burns began her career in New Zealand, devising and writing The Retrievers, an 18-part TV comedy thriller for children. 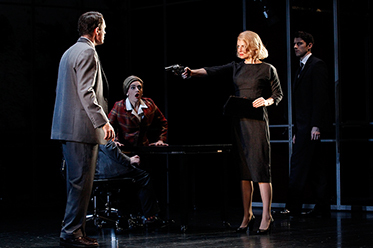 Her first play for adults, Objection Overruled, was performed in all major New Zealand theatres. After moving to Australia, she worked as a journalist with SBS before attending the screenwriting course at AFTRS and writing for ABC children’s television. In Adelaide Burns wrote four plays, including adapting both Haxby’s Circus and High Society for the stage. High Society later toured Australia and the UK. Since then, she has worked as a dramaturg and script editor, and is currently collaborating on three new works for the stage. “We are truly delighted to be now working with Arts Centre Melbourne and to see the play have the future life it so thoroughly deserves,” says Liza McLean of Kay + McLean Productions.